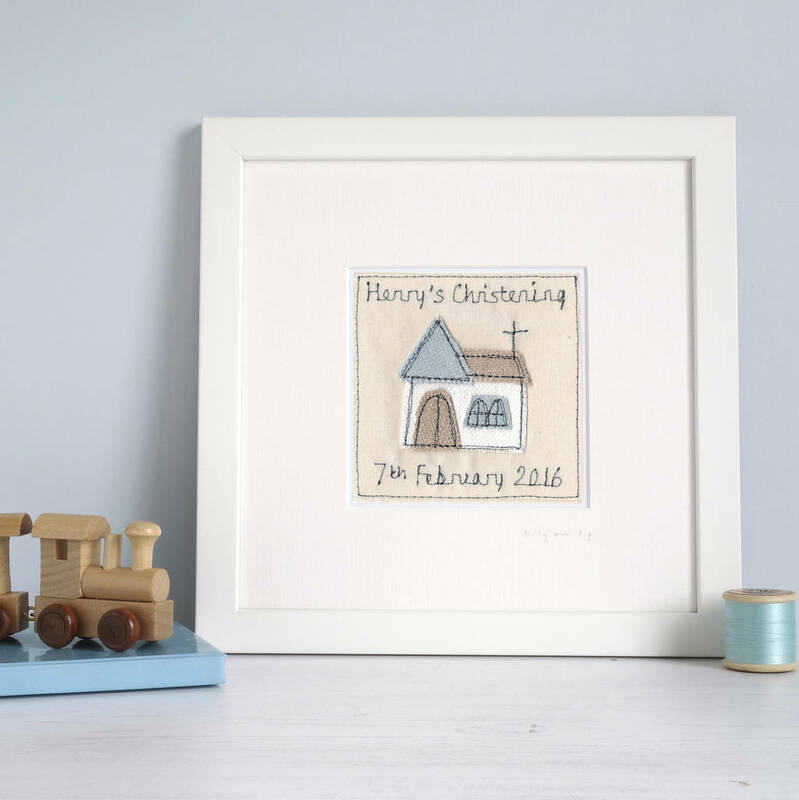 This framed personalised christening picture would make the perfect keepsake gift, it's sure to be kept and treasured forever to remember the special day. 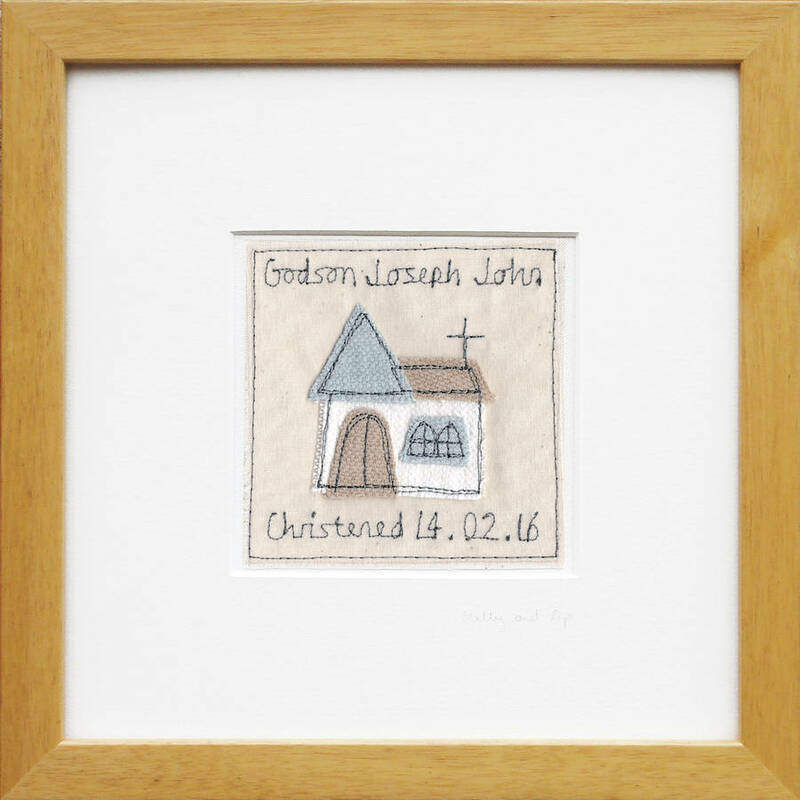 Lovingly handmade in the UK by milly and pip, this embroidered fabric picture is a wonderful personalised christening gift for a boy or girl and is a great keepsake from a godparent to a child on their christening. 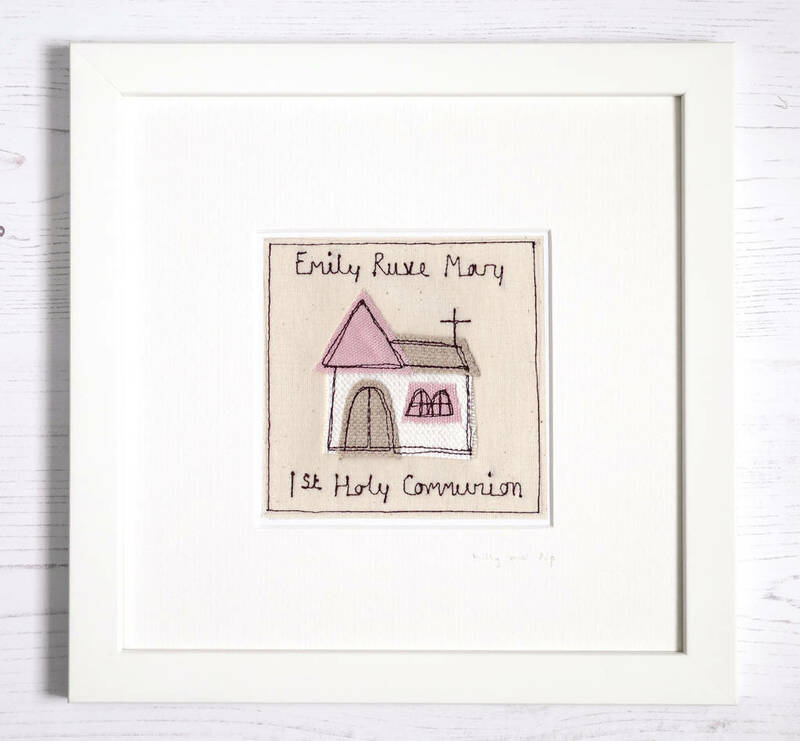 Would also make a fabulous baptism, confirmation or first holy communion gift too. 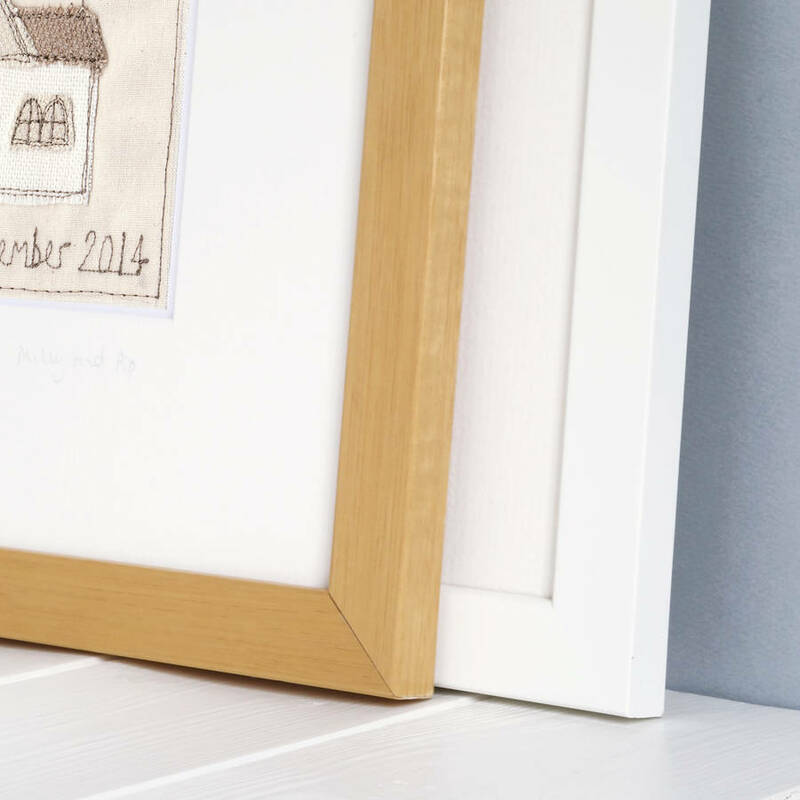 Beautifully presented in a wooden frame, in your choice of solid beech or white coated beech. 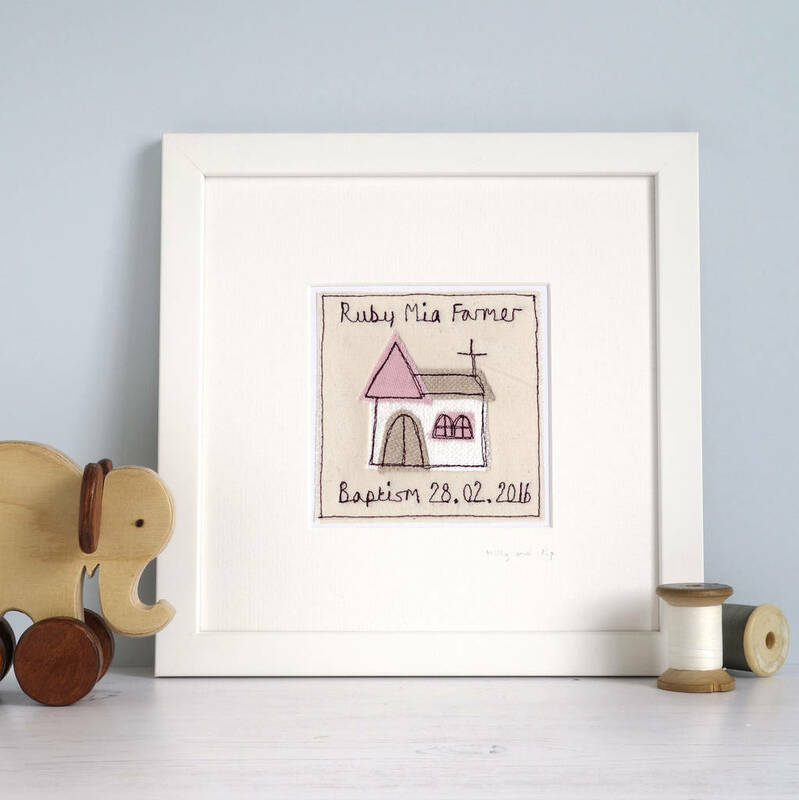 It's ready to hang on a wall or to prop up on a shelf - perfect for the nursery! 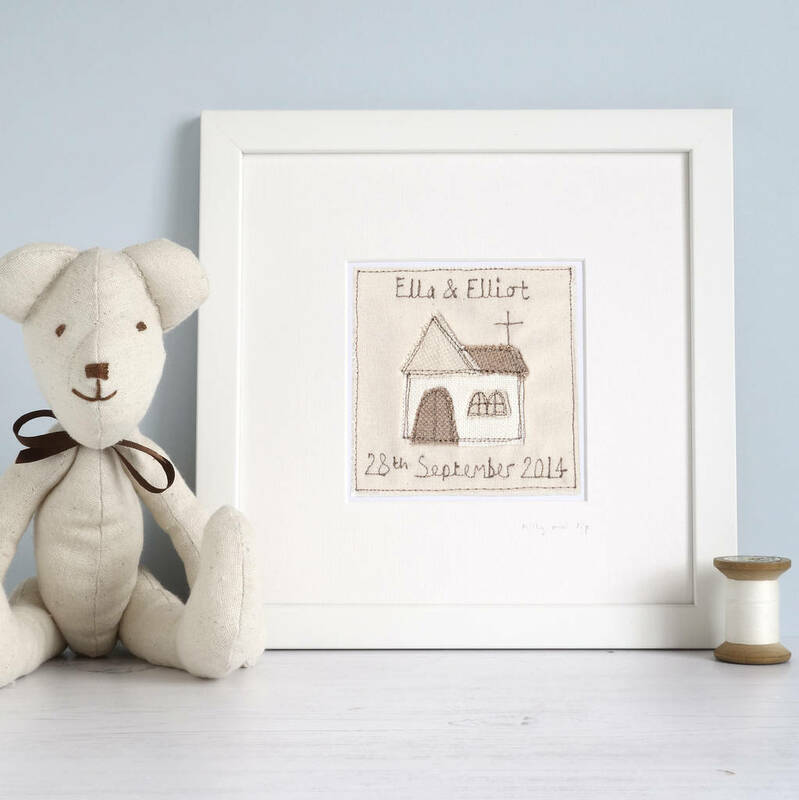 Personalise this unique christening keepsake with any words of your choice, which are embroidered above and below the appliqued church. 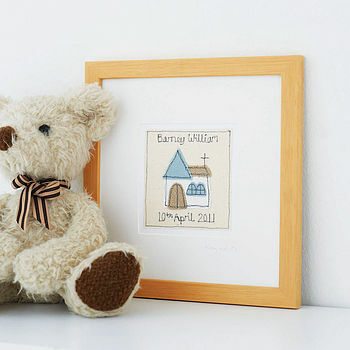 Words of up to 20 characters can be embroidered on to each line, this includes spaces and punctuation marks. Available in 3 colourways, pink, blue or stone. The stone colourway is perfect for brother and sister twins. 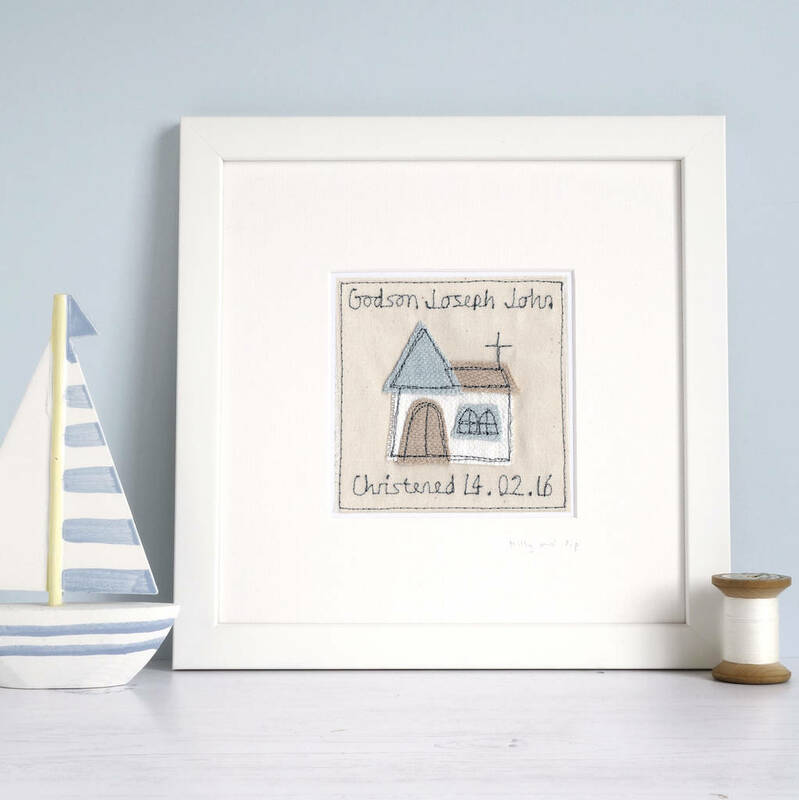 Handmade using cotton calico fabric, with raw edge applique and freehand machine embroidery, which is like writing/drawing by hand using the sewing machine as a pencil. 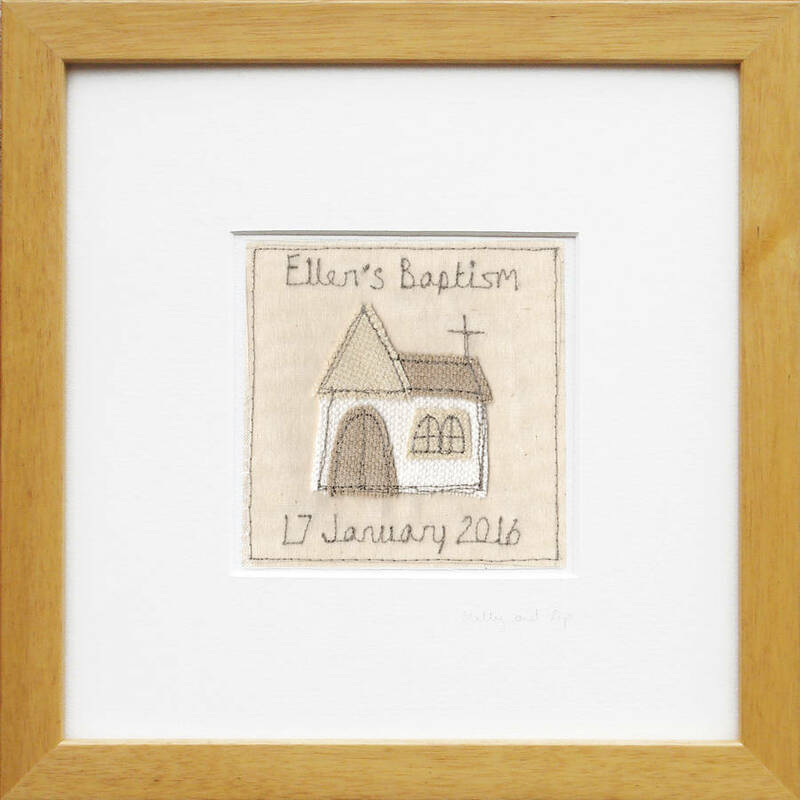 Framed in beech wooden frame with glass front, handmade locally in Derbyshire, UK. 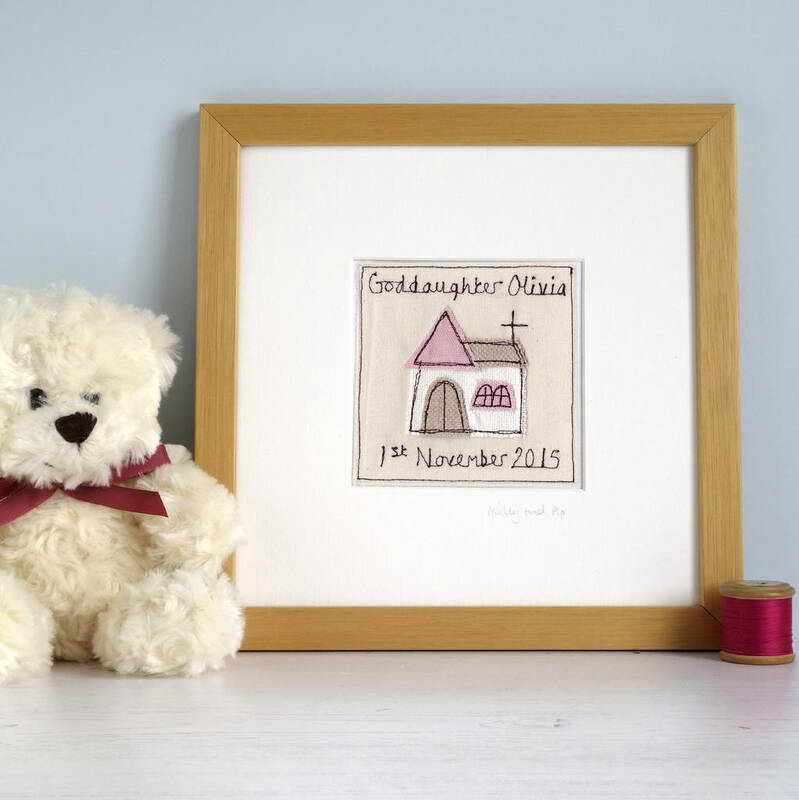 As this product is handmade to order, please take note of our delivery timeframes. 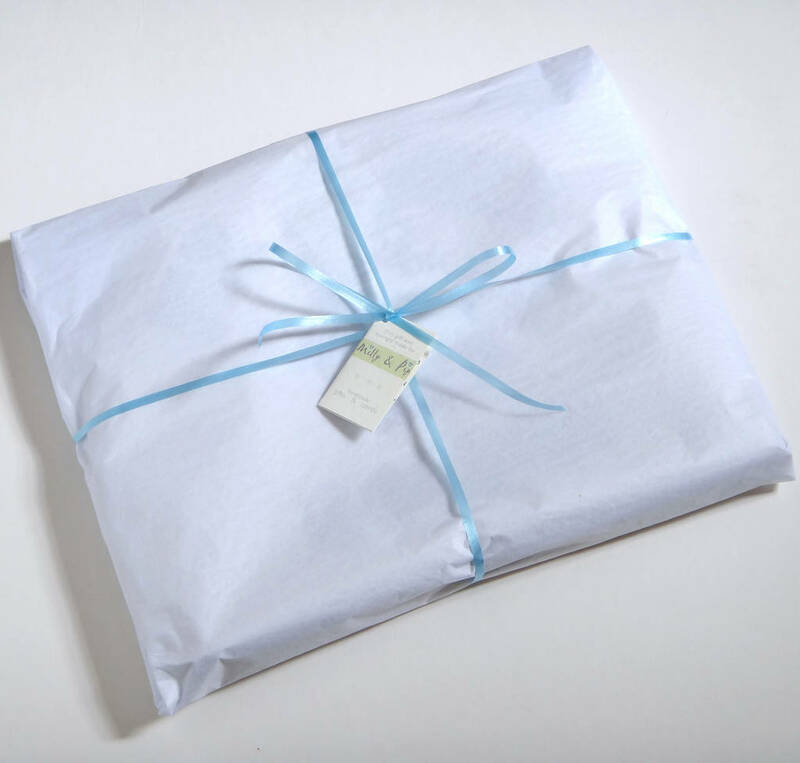 If you would like your christening gift to be sent direct to the recipient, we can gift wrap it for you. Please click the ‘gift options’ box at checkout, where you can add a short message, which will be handwritten on to the gift tag. This product is dispatched to you by milly and pip. As this product is handmade to order, please take note of the delivery timeframes below. We aim to dispatch all orders 2 days before the advertised delivery date. However, if your order is required sooner, please let us know when you place your order and we will do our best to help. MAINLAND UK & NON-MAINLAND UK: We offer 2 delivery options. 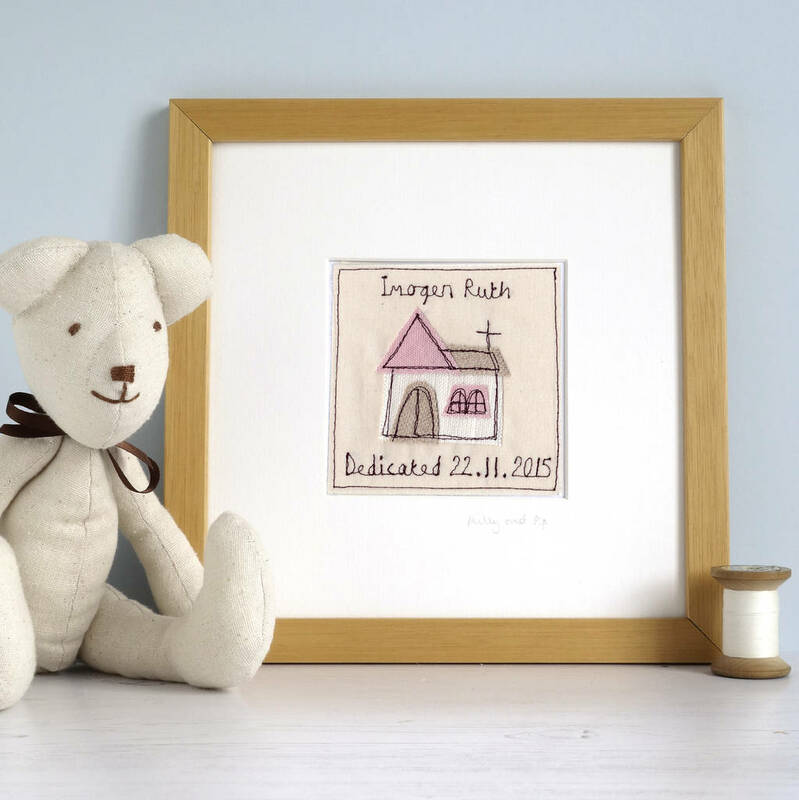 Free delivery via Royal Mail 1st class (Please note that delivery dates provided for this option are estimated) Or tracked delivery via Royal Mail Special Delivery, which is guaranteed to arrive by the advertised delivery date. Please note, Royal Mail Special Delivery requires a signature upon delivery. If deliveries cannot be signed for, they are taken back to the depot and need to be picked up in person from the Post Office, or you can arrange for your parcel to be redelivered by contacting the Post Office.